Cornerstone Financial is widely recognized as the market leader in feasibility studies that comport with the USDA B&I loan program. Our feasibility studies are spiral bound in two tabbed volumes. The Economic, Market, Technical, Financial, and Management feasibility are addressed to provide independent verification of the project. Our feasibility studies are documented with a comprehensive, separately bound appendix, and thorough bibliography. Volume I. The first volume of our feasibility studies contains an Executive Summary and five chapters addressing the Economic, Market, Technical, Financial, and Management feasibility of the project. Executive Summary: An abstract highlighting the primary contents of the study. 1. Economic Feasibility. Project Site, Infrastructure, utilities, and demographics. 2. Market Feasibility. Market Potential, Market Share and Marketing Plan. 3. Technical Feasibility. Design & Engineering. Construction Constraints. Environmental Issues. HAZMAT protocols. 4. Financial Feasibility. 4 C’s of Credit: Capital; Cash Flow; Collateral; and, Character of Borrower(s). 5. Management Feasibility. Is the management team seasoned in the industry and does the company have in place management systems and structure to efficiently operate the business? Volume II. The second volume of our feasibility studies contain the appendix, which is tabbed in alphabetical format. It includes the consultant’s credentials and a comprehensive bibliography. Footnotes & Assumptions; Other Support Schedules. 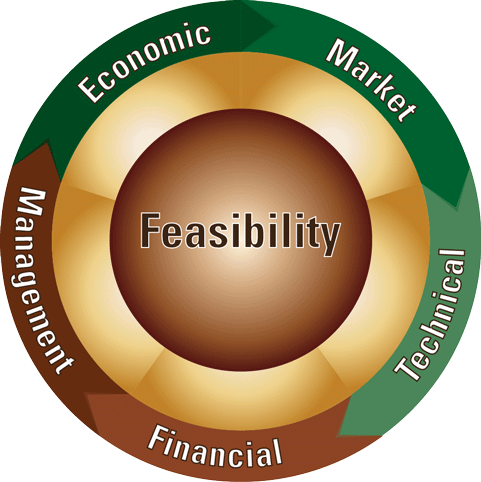 Contact us today to see how our industry-leading feasibility studies can take your business to the next level.